Last week at the Farmers’ Market we discovered misome, a hybrid asian green designed for high temperatures. High temperatures are exactly what Fiddler’s Green Farm, a Yolo County grower, contends with. We brought home a large bunch, unsure what to do with it. 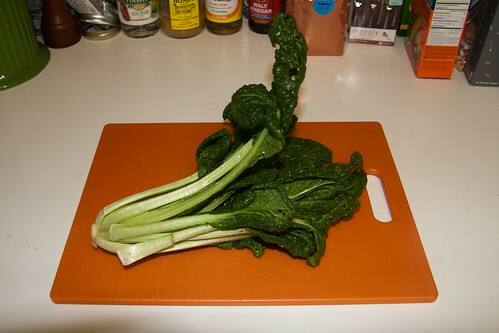 Misome resembles a cross between baby bok choy and kale, with dark leaves and thin, pale stalks. Raw, the stalks are firm and a bit creamy and the leaves taste like broccoli, with a tinge of spiciness at the end. 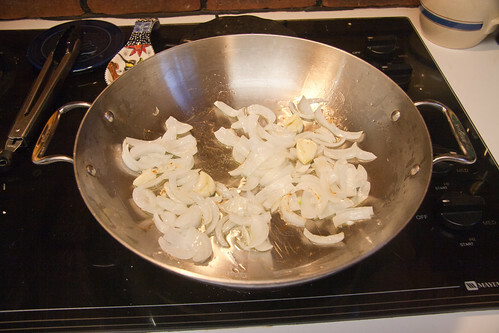 My research suggested that either pickling or stir frying would be a good preparation. 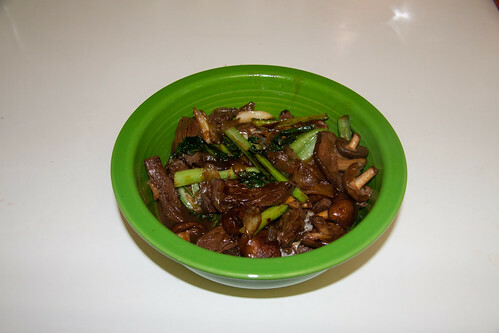 We opted for a stir fry with shitaki mushrooms and skirt steak. 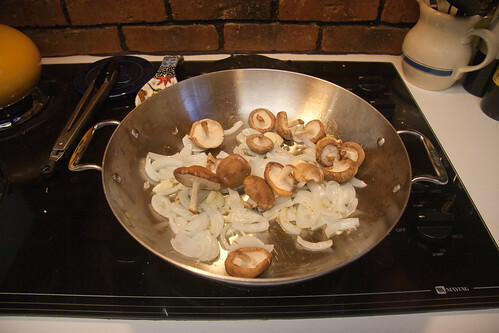 I started by sautÃ©ing some chopped onions and garlic in grapeseed oil. When they became translucent and soft, I added shitaki mushrooms. 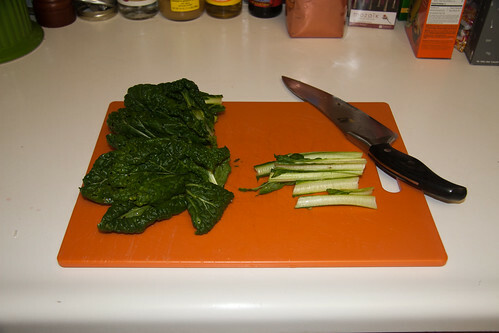 While the mushrooms softened, I washed the misome and chopped it in half, separating the stalks from the leaves. 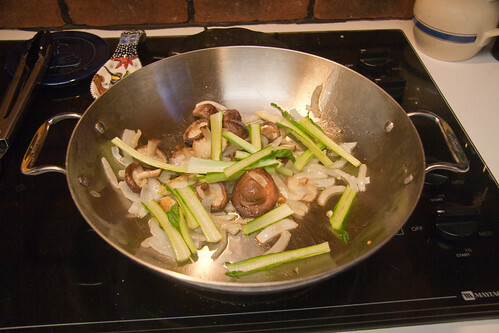 Next I added the stalks to the pan to let them get tender. After about five minutes, I added the misome leaves as well. 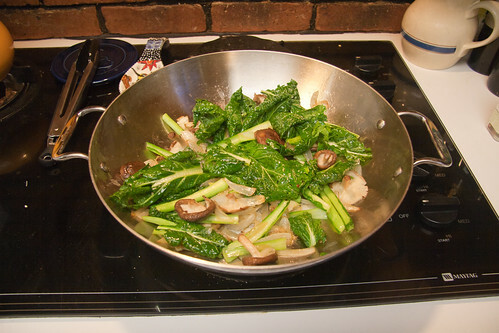 When the leaves were wilted, I removed the vegetables from the pan and added some crushed red pepper flakes. 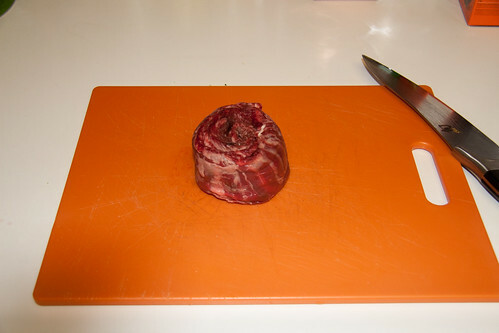 Then I prepped the skirt steak. We are big fans of Five Dot Ranch’s beef, and their skirt steak in particular. It’s nicely marbled, and cooked for a few minutes to medium rare it requires just a little salt and pepper to be melt-in-your-mouth delicious. 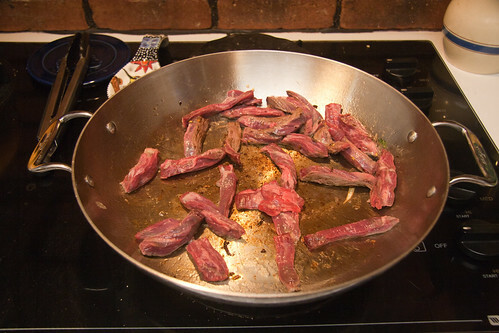 I sliced the steak into small strips, about 3/4″ wide, then added it to the pan. I let the steak sear all over, then poured a little soy sauce over it. 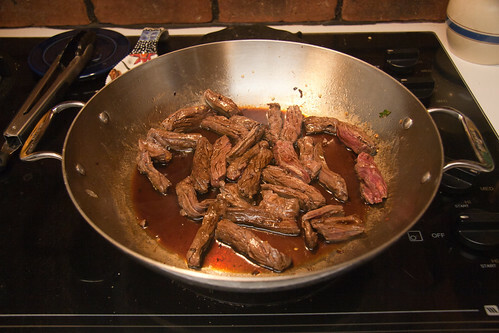 I also poured some teriyaki sauce over the vegetables, then returned them to the pan with the steak. I stirred everything together and let it cook for another couple minutes, then removed it to a bowl and poured the pan juices on top. 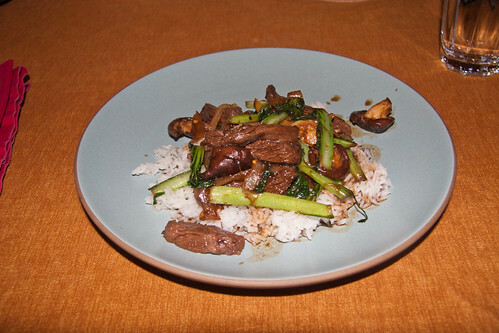 We enjoyed this stir fry over white rice. 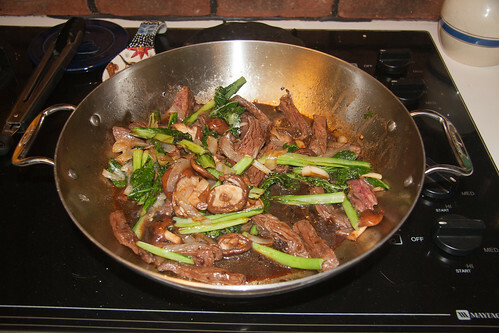 The cooked misome was robust, with a bit of spice and bitterness, and accompanied the steak and shitakis nicely. I expect that using a second bunch of misome instead of the steak would be very successful as a vegetarian stir fry, if that were your preference.